I know I haven't blogged in while, my mother reminded me! I have been in a bit of a fall rut, I think part of that being that I am ready for fall, wearing cute sweaters and boots, wrapping up in a throw on the couch to ward off the chill in the air and eating warm bowls of homemade soup. That sounds so wonderful, yet it really isn't happening. The air conditioner is still going strong, I occasionally wear a light sweater only to take it off by noon because I am sweating. And although I am making those delicious comfort foods of fall and winter, it isn't quite the same when it is still 87 outside. Our ladies group just finished our fall Bible study at church. Asking forgiveness for being such a "Negative Nellie" in this post, but just to be completely honest I have become a bit disillusioned with women's Bible studies as a whole. I feel as if the format has become somewhat stale, and although the study of God's word is always exciting and applicable, it seems that the writers of studies all follow a formula and each study is somewhat like the last. In many studies I feel manipulated by the author to get out of the text what they want me to, instead of allowing the Word to speak for itself. I believe there is a place for Bible study aids, but I am wondering if we have become too dependant on certain writers to tell us what the scripture says instead of digging in God's word for ourselves. I am just sharing some of what I am thinking, but I would be interested in your thoughts. Do you get together with a group regularly, are you assigned homework and if so do you do it? Do you use devotionals or do you just read the Bible? Is it just me or is anyone else struggling with some of the same stuff? Thoughts and comments welcomed!!!!! *I feel the need to say I enjoyed our study of Nehemiah this time and was reminded by God to pray steadfastly for our country asking for forgiveness of our collective sins and that He would raise up a Godly leader for our nation! So this is in no means a reflection of this particular study, but just an overall observation of several years of studies. Thank you, Gay, for your honest and open opinion. I agree with every word you have written. I've taught women's Bible classes for many years, at our church and including 14 years in my home....as hostess and teacher. By and large, I've always taught directly from the Bible, verse by verse. Also, I've written and taught 4 Bible lessons for women myself, but two of them were verse by verse, "Daniel" and "The Revelation". The response and class participation was always excellent. There is no question I have learned much from Bible studies written by others, but I'm changed, encouraged, strengthened, and led much, much more by teaching or reading directly from God's Word, the Bible. The late and wonderful, Dr. Howard Hendricks, was a professor at Dallas Theological Seminary. He once said "It's amazing what light the Bible can shed on Commentaries." One could substitute his use of the word "Commentaries" with "women's typical Bible studies." Thank you Adele! I am thankful for faithful Bible study leaders! We are a new church & are 2 weeks into our 1st women's bible study. 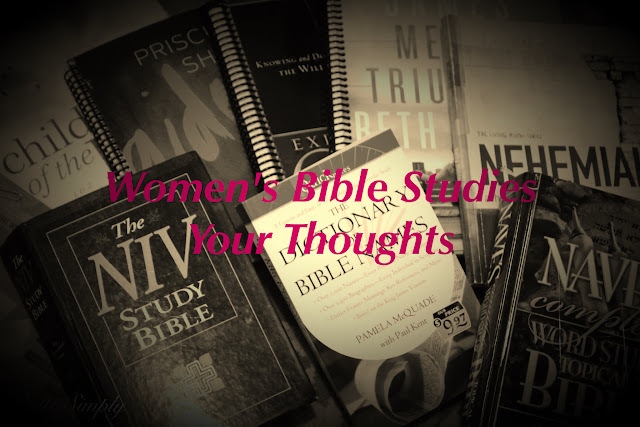 Our bible study is "women of the bible". It is week to week, meaning if you miss a week, you can come next week because there is no carry over, & NO homework. It has been AWESOME!!! Quite refreshing from other Women's bible studies I have been in before. I am a pastor's wife and I love your blog!!! Thanks! Thank you Elizabeth. God is good and we are blessed with knowledge of Him when we study His word. This study does sound like a refreshing change from the normal format for studies!! I know lots of busy moms who would love this, no guilt!!!!! !